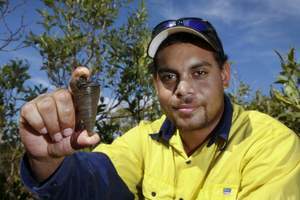 Researchers are helping traditional owners to check the health of a bush tucker staple that is still being collected in and around Darwin. The Healthy Marine Harvest is a collaborative project between Charles Darwin University’s Research Institute for the Environment and Livelihoods, Larrakia traditional owners, and funded through Territory Natural Resource Management. The aim of the project is for researchers to work with local Indigenous people to check the health of the shellfish at popular traditional gathering sites in and around Darwin Harbour. CDU microbiologist Dr Anna Padovan said the project arose due to concern by traditional owners regarding the safety of eating shellfish from particular waters in the harbour, mainly near sewage outfalls. “Determining whether shellfish and marine invertebrates collected for eating have elevated metal or bacterial levels has significant implications for the health of the people using these animals as a food source,” Dr Padovan said. Larrakia representative Ms Lorraine Williams said the Healthy Marine Harvest project combined knowledge of shellfish collection from Larrakia traditional owners with researchers’ analysis. “Larrakia families are having to travel further out from the traditional gathering sites in and around Darwin due to concerns about the health of bush tucker in urban areas, particularly in areas around the harbour that have been developed,” she said. Ms Williams said the shell middens found in and around Darwin were important archaeological features, indicating consistency of the collection of shellfish by generations of Indigenous women. “What has changed is the range of species. There are not many shellfish species left in the Darwin harbour region, so we hope that this research may also lead us to some answers about the health of the ecosystem in general,” she said. Ms Williams said that Larrakia trainees would also work alongside CDU staff in the laboratory learning new skills. “The traditional owners involved in the project will then be able to relay the results to the various groups who are out shellfish collecting. “Once we have established the baseline data, it is hoped that this type of research will be ongoing,” she said. This is a $77 000 project funded through Territory Natural resource Management.